The term Dewa Yadnya means the religious ceremony dedicated to God in all of His manifestation which is carried out in a temple or other holy place. The Dewa Yadnya is one Panca Mahayadnya (Five Great Yadnya) as describes in Taittriya Aranyaka 2.10. The Dewa Yadnya in Bali includes the ceremonies such as Memungkah or Ngenteg Linggih, a ceremony performed when using a building for the first time or renovating a temple. Odalan, a ceremony performed every 210 days. Betara Turun Kabeh, a ceremony conducted every one year of Saka Calender. Panca Wali Krama , the ceremony dedicated to God every five years of Saka Calender. Eka Dasa Rudra, every 100 years of Saka Calender. The Dewa Yadnya set – collection of Bali Museum consists of a number of Pratima (certain God statuettes), Pralingga (mythological of God’s vehicle), Janggawari (a construction used to lay down the Pratima in the purification procession ceremony towards the sea or water resources), and a few of pots to keep the Tirtha (Holy Water). 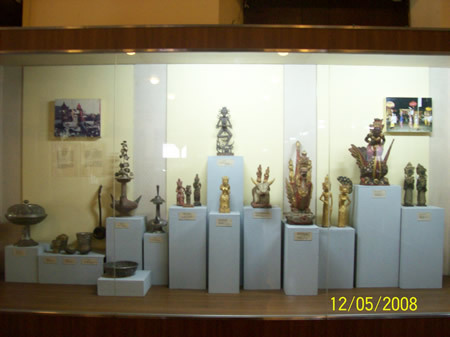 I will tell you about Pratima and Pralingga collected by Bali Museum. 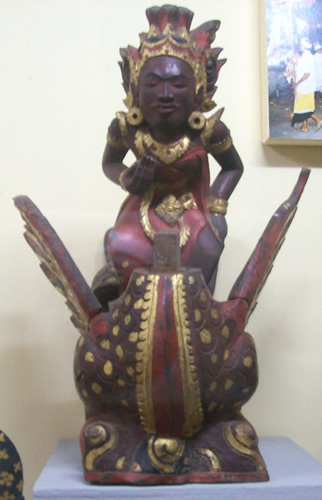 Some items of Pratima are: Rambut Sedana, Dewi Saraswati ( Goddess Saraswati ), and also Siwa and Durga Mounted On A Bull. Rambut Sedana is a Pratima to worship the God of Wealth. It is assembled by chinese kepeng coins. Rambut Sedana is beloved by merchants. Dewi Saraswati is the Goddess of knowledge, music and art. The Pratima of Dewi Saraswati is worshiped to bless the holy scriptures and literatures being held by Hindu family. The adoration is also to protect and avoid the devotees from laziness and unawareness. 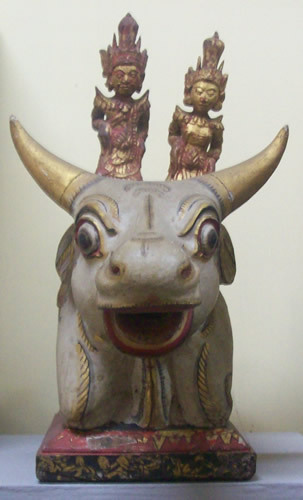 Siwa and Durga Mounted on A Bull is another Pratima displayed at Bali Museum. 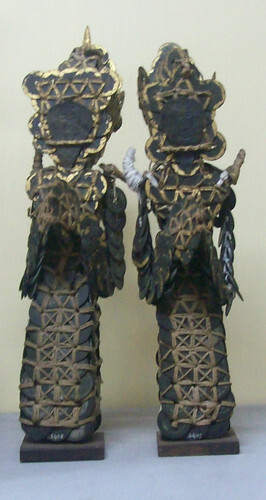 In Hinduism, Siwa is one of the Trimurti ( the three primary aspects of divine ). According to the Trimurti system, the creator is Brahma, the maintainer or preserver is Wisnu, and the destroyer or transformer is Siwa. Meanwhile Durga is demon-fighting of Siwa’s wife, Goddess Parwati, as described in Markandeya Purana. Pralingga Macan is the God’s vehicle in Tiger form. Tiger is the vehicle of Goddess Durga. According to Markandeya Purana, the form of Durga was created as a warrior goddess to fight a demon called Mahishasura. The Goddess Durga rode Her tiger and killed Mahishasura with Her trident. One can learn more about Dewa Yadnya and spirituality at Bali Museum. 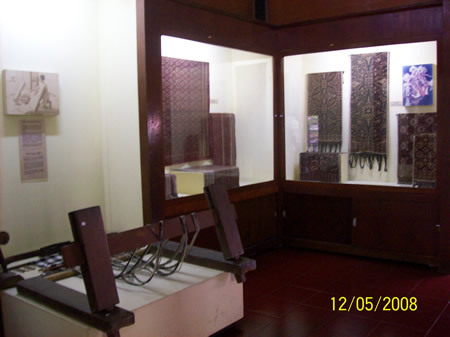 On May 12, 2008, I went to Bali Museum in Denpasar City, Province of Bali, Indonesia. 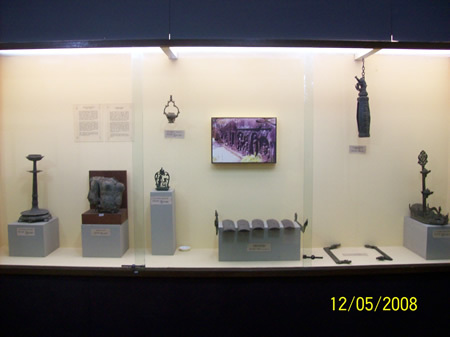 Bali Museum is located at Mayor Wisnu Street, Denpasar. You can easily reach the museum since it is located in the center of the city of Denpasar. Tabanan Building was a contribution from the royal family of Tabanan Kingdom. 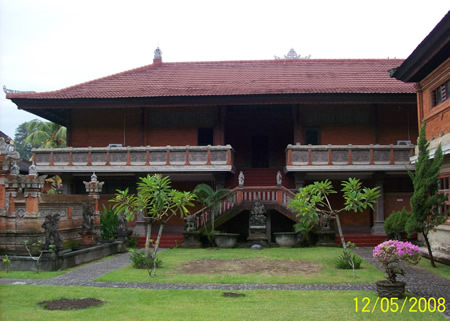 Its architecture is of Tabanan style representing that of south Bali in general. In former time such building was used to store the wealth and valuable properties of the king in the form of art objects as well as sacred equipments and tools. The width of Tabanan Building is 155 meter square meters with two roofs, one under the other like meru shrine. Its original form is : a two-roof building, with one elevated room at the center surrounded by a solid wall (now only a glass bar), and equipped with a door in front and two small windows on the right and left hand sides of the wall. The surrounding and lower leveled veranda is equipped with a number of poles at its edge to support its roof. The space between the two roofs is solidly blocked to keep safe all objects stored inside. The name of this building is taken from the name of Karangasem regency of east Bali who has built this building in year 1925 for the Bali Museum. This building is in the form of the Balai Penangkilan (a meeting place) in the king’s palace of Karangasem with architecture of east part of Bali which has combined with the temple style and modified in accordance to museum’s need. The Karangasem Building collects many items such as Wuku Calendar, Palelintangan (Bali Astrological Calendar), and Lontar Manuscripts (Manuscripts written at palm leaf cut into length about 20-40 cm). 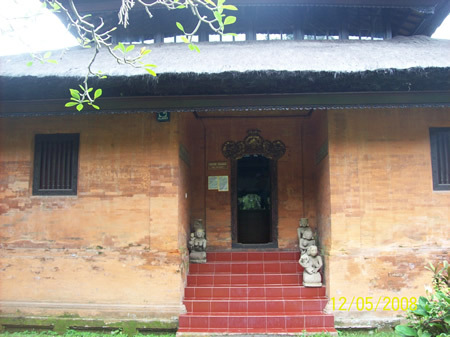 The name of this building is taken from the name of the Buleleng Regency of the north part of Bali who has presented this building to the Bali Museum in year 1932. The building is represents the style of a temple pagoda ( meru ) with the architecture of north part of Bali style which is normally built in the temple and has modified in accordance to the museum’s need. The Buleleng Building displays traditional spinning wheel and loom. On Balinese loom, the warp is stretched between a heavy wooden structure and a sort of yoke shaped like a bow held by woman’s back. The East Building of Bali Museum is built in 1969 by Pelita Project held by the Government of Indonesia during Suharto era. 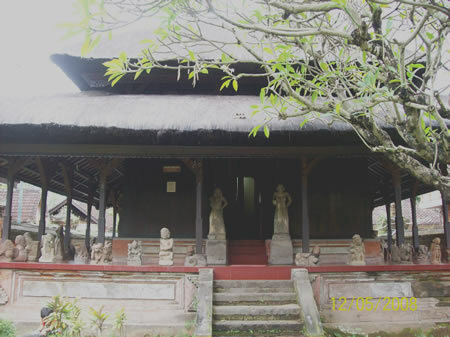 This two-stories building displays various pre-historical and historical collection of Bali, and also the development of art painting and sculpture in Bali since 16th century until present time. What’s inside the East Building of Bali Museum ? Here you can find Stone Throne, Sarcophagus, Site Map of Bali Pre-historical Period, Hunting and Cutting Things of The Paleolithicum Period, Stone Tools of The Neolithicum Period, Sharp Weapons of The Paleomethalic Period and Traditional Weapons of The Modern Period. 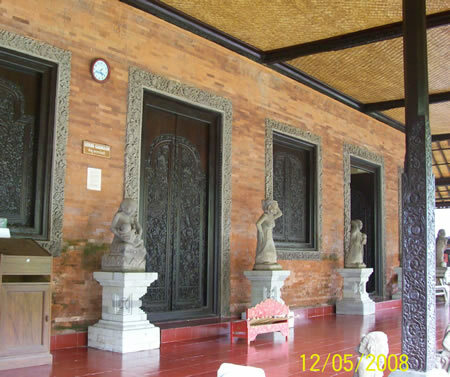 The East Building of Bali Museum is also collecting Stone and Bronze Statues of The Ancient Period. 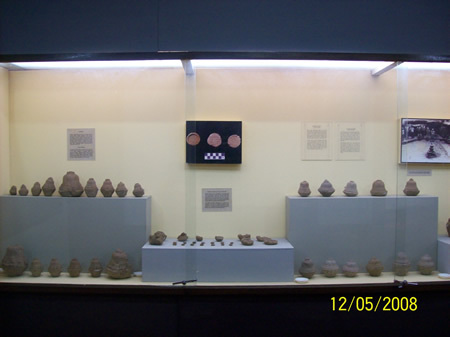 The Twin Lingga, Sandstone Statue, Priest Statue, Bronze Light, Jars and some types of ceramic of The Middle Period are also displayed at The East Building of Bali Museum. This is an interesting museum to visit. Do not forget to visit Bali Museum.